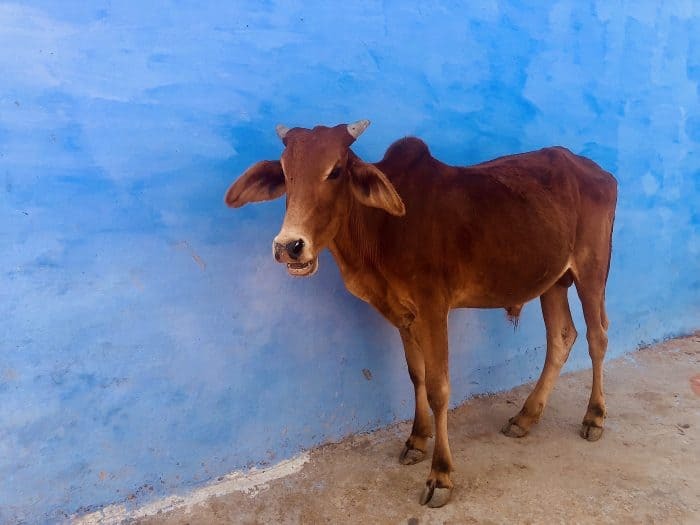 Travel writer Janice Nieder continues her adventurous and colorful adventure across Bundi, India. ICYMI: Part 1. We were staying at the heritage (in this case extremely rustic) Ishwari Niwas Hotel, owned by relatives of the Diggi Palace. 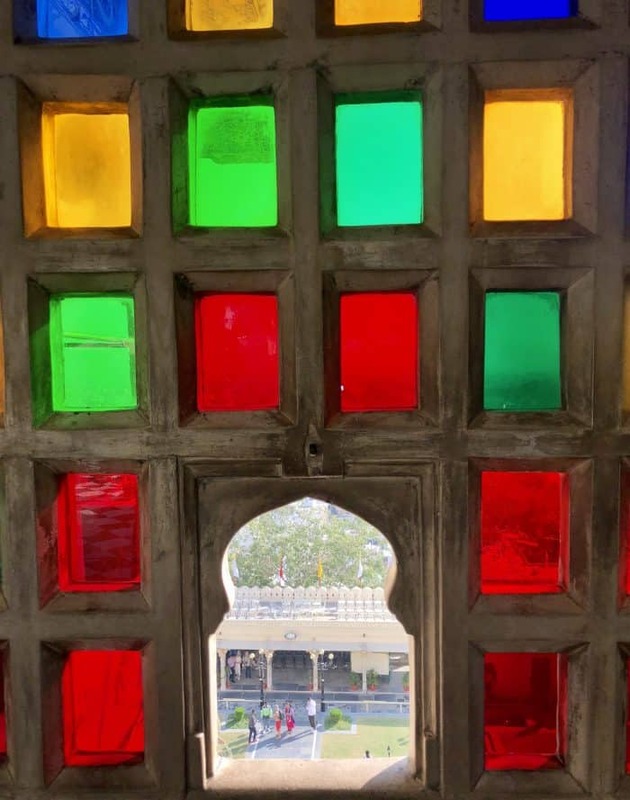 Although the grounds were quite lovely and the couple that owned it, Lucky Singh and his wife, Mayerakshi, (not sure of the spelling) were charming, it was more reminiscent of the “Best Exotic Marigold Hotel” than a palace. My waaay upstairs, dark corner, bare-bones room had stained sheets with toilet paper the texture of papadum. However, I did peek into some other rooms which looked ever so much nicer. The owner’s wife, beautifully draped in an exquisite sari, conducted a lengthy cooking class, while her baker proficiently demonstrated how to make roti, chapati and various other breads. I was more fascinated with how our sophisticated, impeccably dressed hostess managed to keep her sari from catching fire! During the Garh palace tour, Diggi pointed out a well-preserved mural of a hunting lodge from around 1875 which was owned by the same Singh family. Coincidentally we were going there later for a catered dinner complete with live music and more Diwali fireworks. The next day was fabulous. 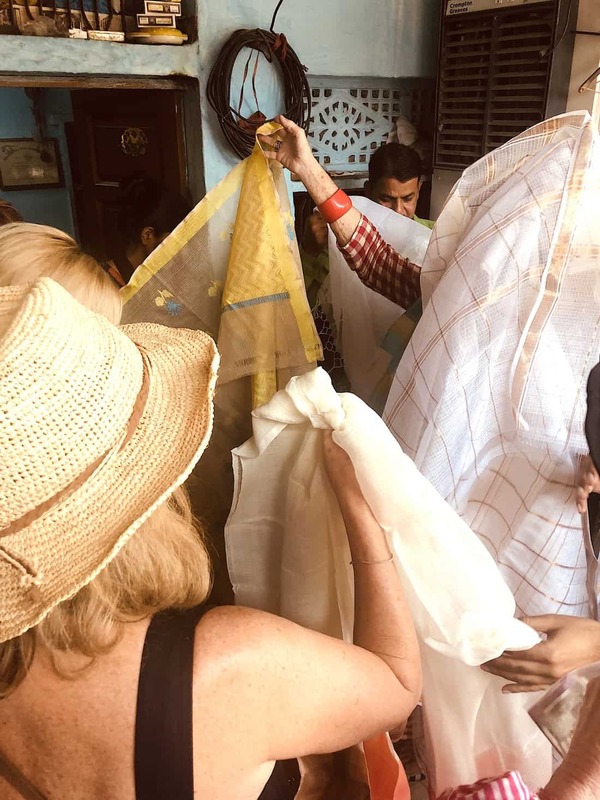 We got way off the beaten path, driving to the gold and silver weaver’s village of Roteda, where the entire community turned out to welcome us, with either delighted waves and shout-outs from the children, “Hello, where are you from? Can I have a photo?” or shy, curious stares from many of the elders. Obviously, Westerners were still a rarity here. The sacred cows could not be bothered. We followed the rhythmic thumping of the handloom pedals until we arrived at the home of a family of silk weavers. 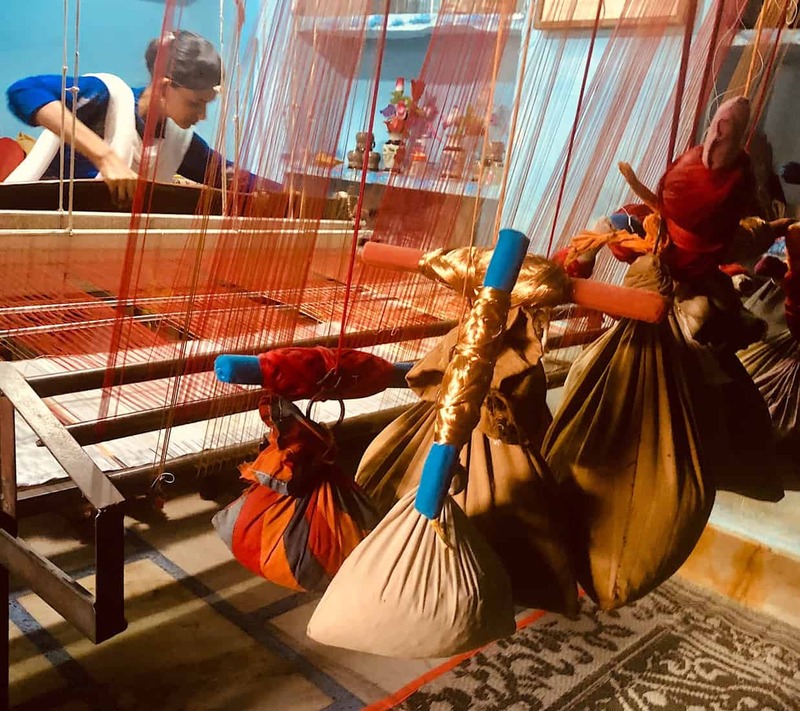 The girls took turns working the loom, methodically slipping the shuttle from side to side, then beating down the weft, as they wove delicate patterns comprised of pure gold or silver threads and colorful silk yarns. Weaving with gold and silver threads. 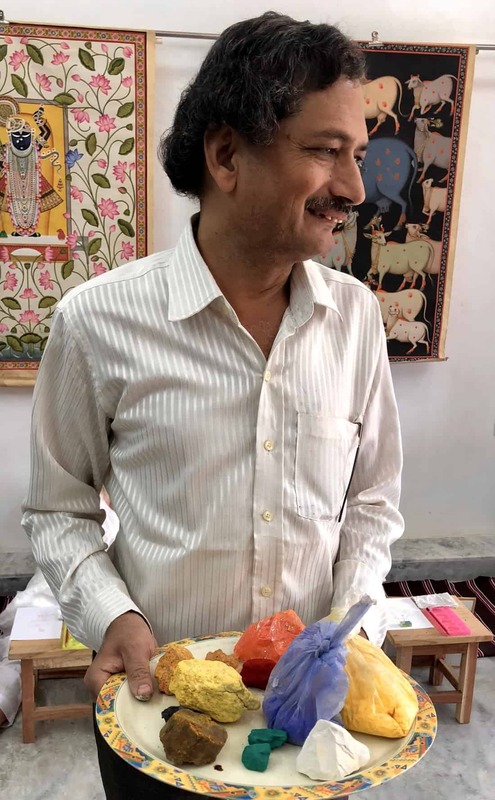 Although they only sell wholesale we were allowed to buy from the artisans directly, at discounted prices, which quickly erupted into a post-Diwali shopping spree! 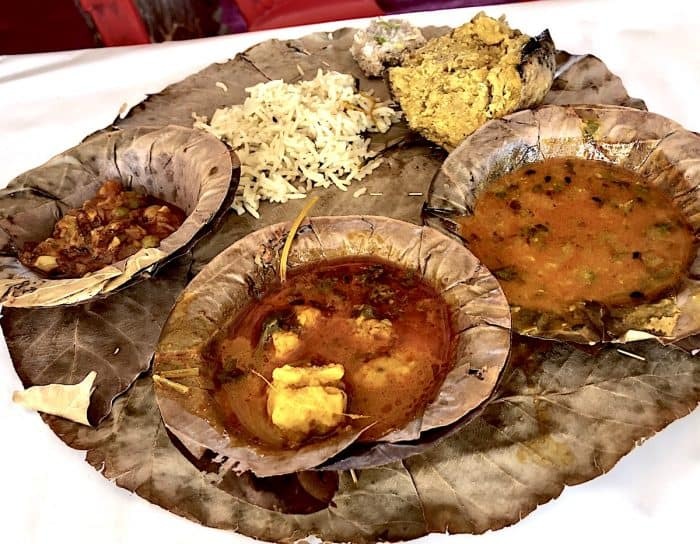 We went even deeper off-road to lunch at another of the Singh family holdings, a wonderful, dilapidated, semi-abandoned palace, though there still was a family temple there, oozing character, where we were treated to a traditional family meal served on disposable leaf plates. Diggy taught us how to eat the hot saucy food with our fingers; first rolling it in bite-sized balls and then flicking it into our mouths with our thumbs. A six-hour drive to reach our next destination, but thankfully, we were in comfy mini=buses, and, midstream, Diggy broke out the chilled bubbly. How we loved this man! 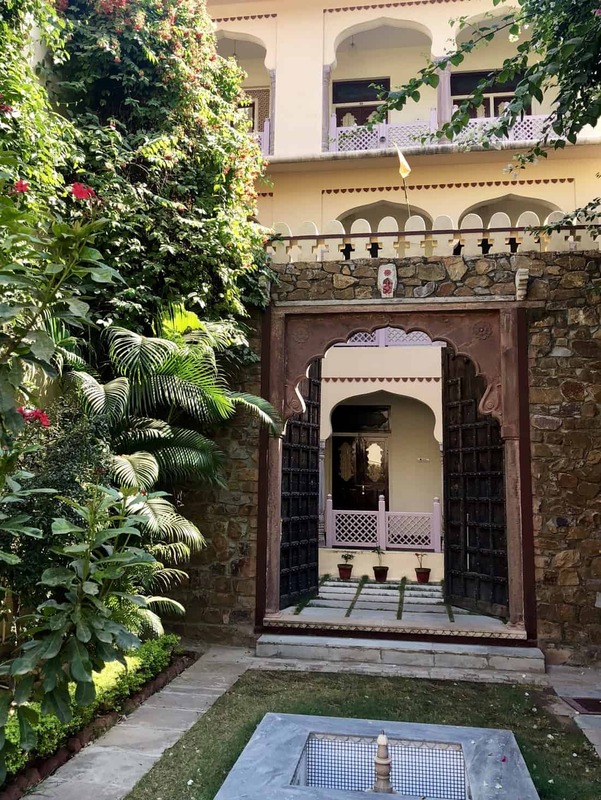 Our glam Jagwat Niwas digs! 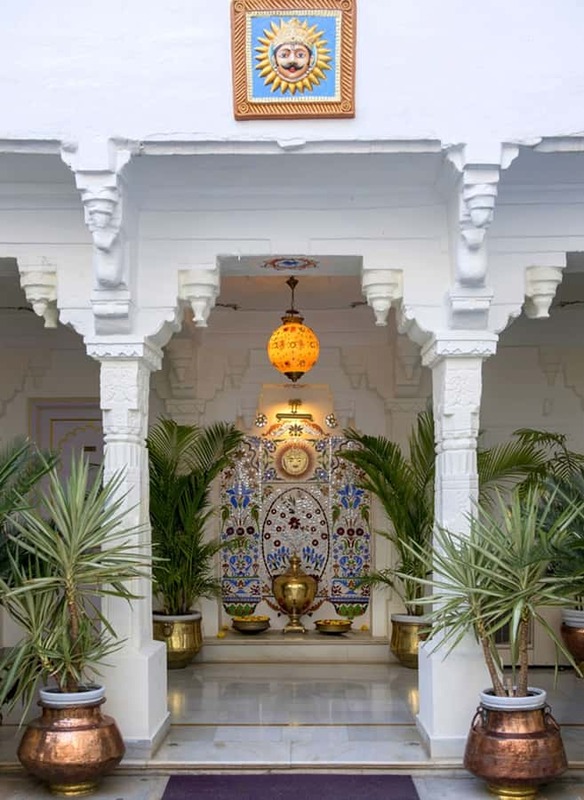 From the second we arrived at our pristine hotel, the Jagwat Niwas, perched right on the edge of the shimmering Lake Pichola , it was crystal clear why Travel + Leisure readers chose Udaipur, India, as their favorite city in Asia in the 2018 World’s Best Awards. 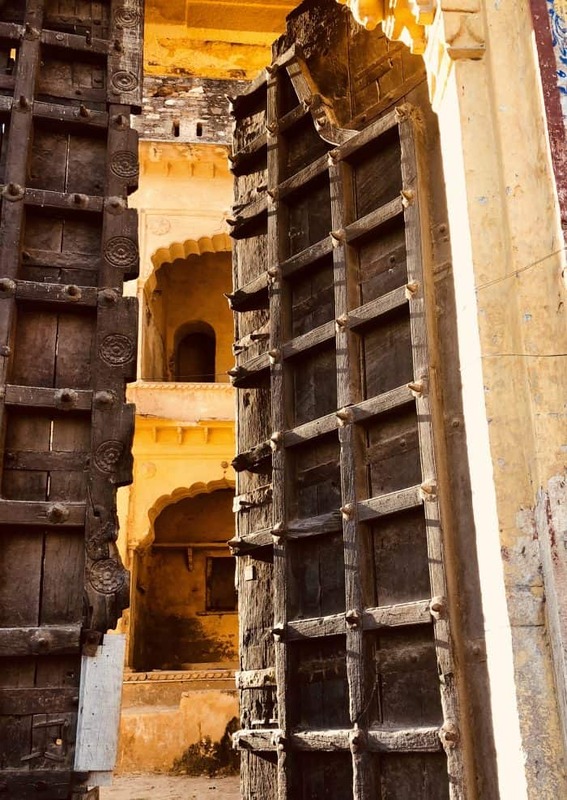 Granted, it’s a more sanitized, touristy version of Rajasthan than we were used to, but I was ready for a little break and this former royal capital, oft compared to Venice, screams romance. Loved the soothing white-on-white with little shots of color. 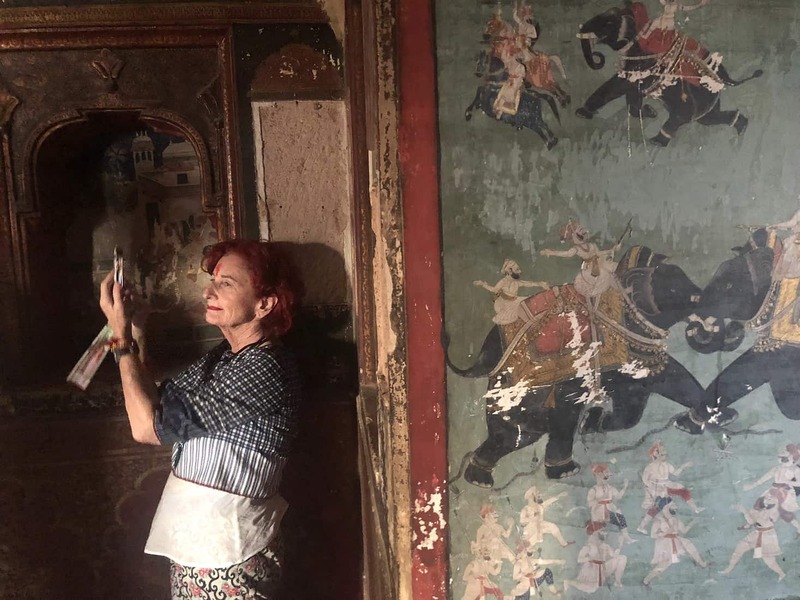 The Jagwat Niwas, an early 17th-century haveli (mansion) featuring traditional Mewar architecture, was definitely our most glam hotel to date with a legion of well-trained staff at the ready to take care of your every need. 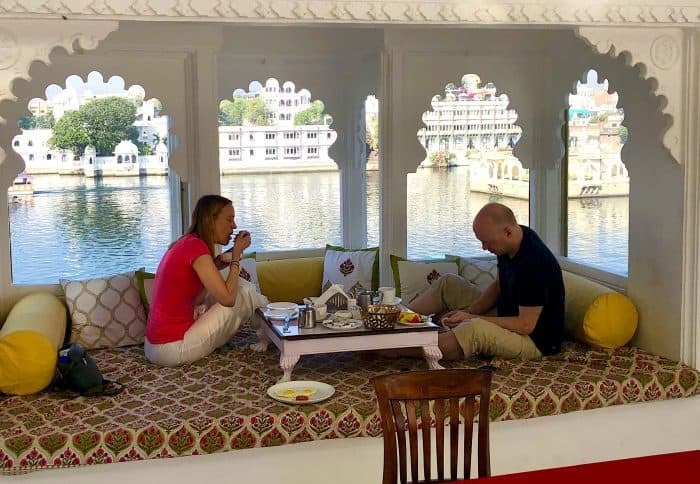 Meals were served on the roof terrace with a picturesque backdrop of the decorated ferry boats, chirping birds, and sun setting over the lake. Even the breakfast nooks had stellar views. Every room is different, with unique décor and views so if you’re not in love with your first one, keep looking. I settled on my third room! The common spaces are a relaxing study of white on white accessorized with brilliant green plants housed in copper pots and colorful bougainvillea. Diggy took us on a preview shopping tour through town, pointing out the best place to pick up a pair or four of colorful jutti, unbelievably inexpensive shoes, traditionally made up of leather and with extensive embroidery, We stopped along the way to taste some local delicacies including two types of sweet, bubbling hot, gulab jamun. 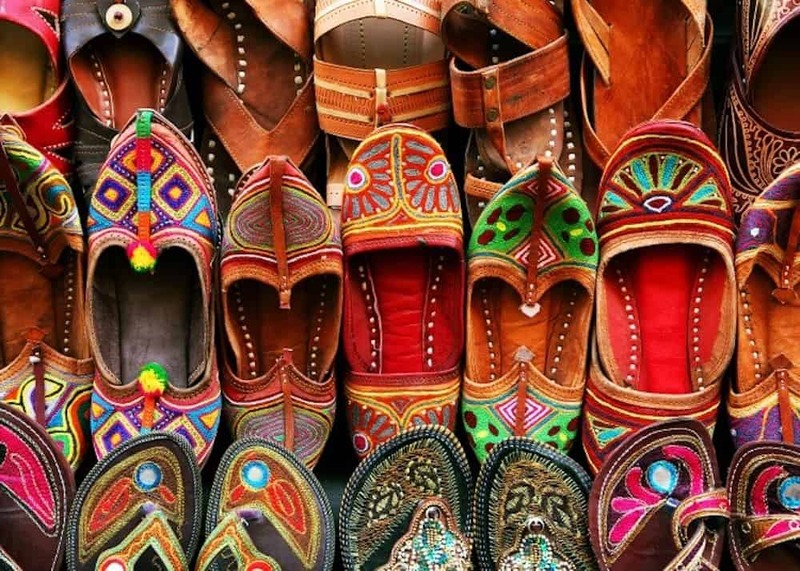 Although there is lots of good shopping in Udaipur, for some one-of-a-kind, handcrafted souvenirs that you’ll feel good about buying, head to Sadhna-a Women’s Handicraft Enterprise, which started with 15 women and now has empowered 680 member-owners by selling their work. I stocked up on the scarves and ankle bracelets and then bought a slew of their $2.00, multi-colored, hand stitched cloth bags, perfect for “wrapping” all my other gifts in. I thought I was palaced-out but our tour of the enchanting City Palace was mind-blowing. This colossal masterpiece, built over three centuries, is now ruled by the 76th member of the same royal family! 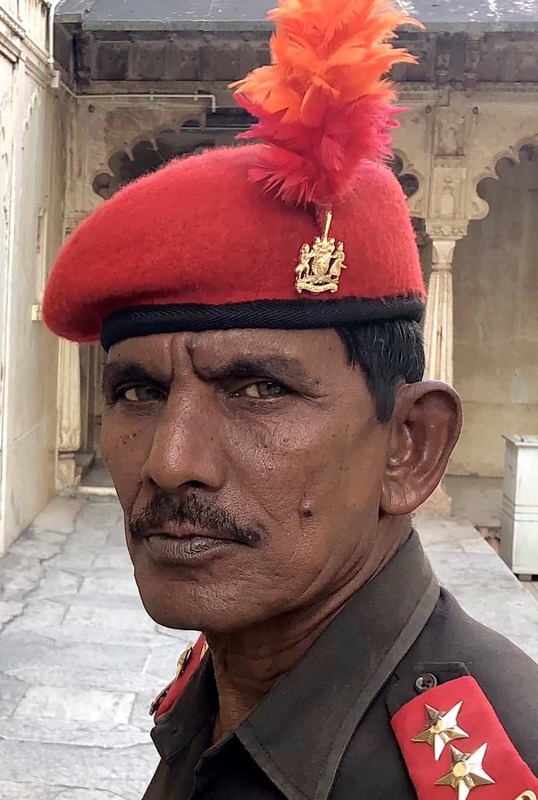 Just when I was going to touch something I saw this palace guard and thought better of it. 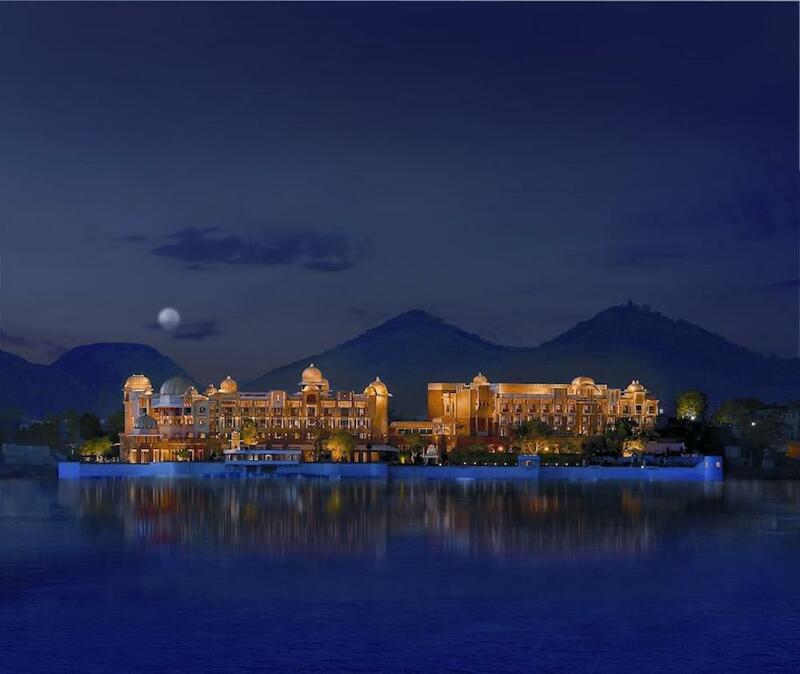 It’s made from the finest marble, wood and granite, embellished with intricate carvings, colorful murals, paintings, mirror work, crystal chandeliers, and jeweled mosaics. There still have the old cages out front that used to house the tigers and leopards. 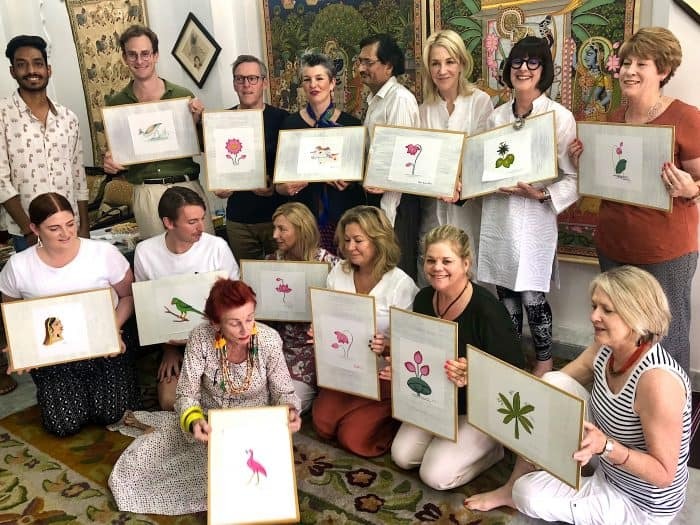 It was time to tap into to my (deeply) hidden artistic side since Peta had arranged a private painting workshop at the home of master temple painter and contemporary artist, Raja Ram, whose work has been exhibited all over the world. The walls are lined with his pichwai, the cloth paintings that hang behind the Krishna statue in Hindu temples made from hand-ground mineral pigments on recycled paper. Showing off our finished masterpieces. Is this a talented group or what? It was surprisingly fun, and funny, when his son sadly shook his head at my feeble attempts to reproduce a lotus, reached for my brush and with a few quick strokes turned it into a semi-masterpiece. 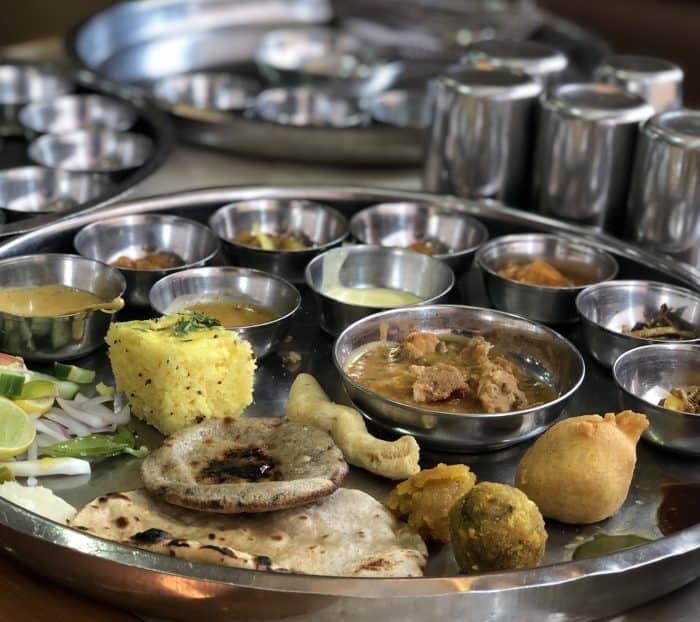 All those flowing creative juices made me hungry, so I chowed-down at lunch, which was a yummy, vegetarian Gujerati Thali lunch. 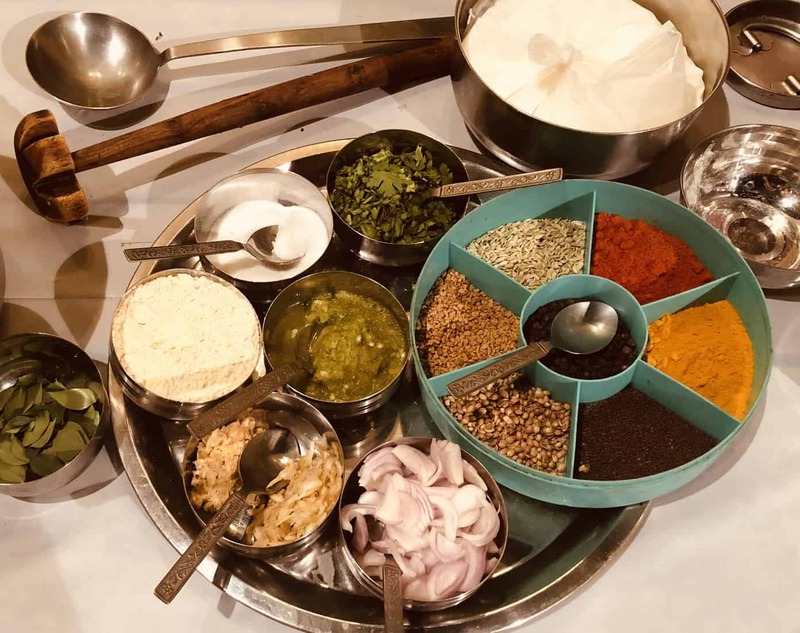 It was full of different textures and flavors including an addictive Dahi Bhalle , puffy fry bread topped with a sweet & sour, tamarind and coriander chutney. We loved our thali lunches! Dinner called for our finest jewel-toned safaris since we were dining at the stunning Leela Palace, which is consistently rated as one of the best hotels of the world. We dined outdoors at Sheesh Mahal, where the flickering lights, soft breezes and breathtaking views under the starlit sky were truly special- unlike our mutton stew (no other choices were offered) dinner which was merely meh. 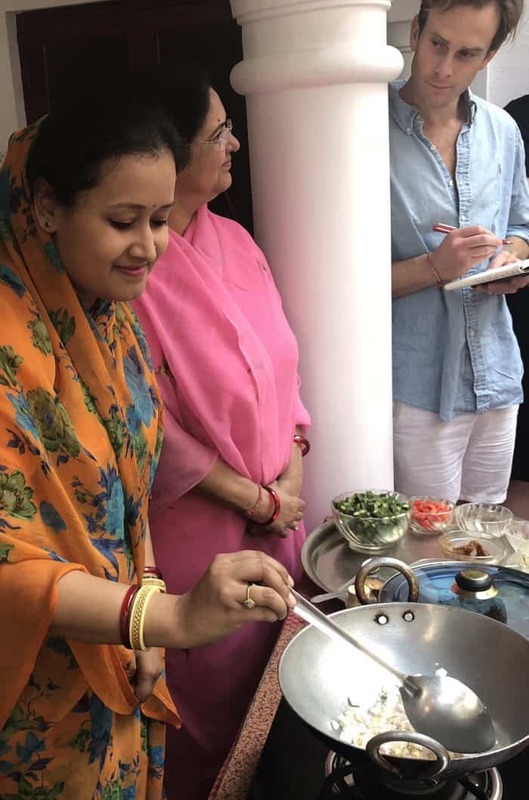 My favorite cooking class and lunch was a royal repast at the home/restaurant of the renown Bedla family who shared authentic 200-year-old royal Karen recipes that had delighted such distinguished guests as the Shah of Iran, Queen Elizabeth and Jacqueline Kennedy. Sharing the secrets of Karen cooking. Mother and daughter-in-law demonstrated several dishes from this unique Indian cuisine which relies heavily on corn, okra, milk, dal, and smoked flavors. Learning how to smoke yogurt! 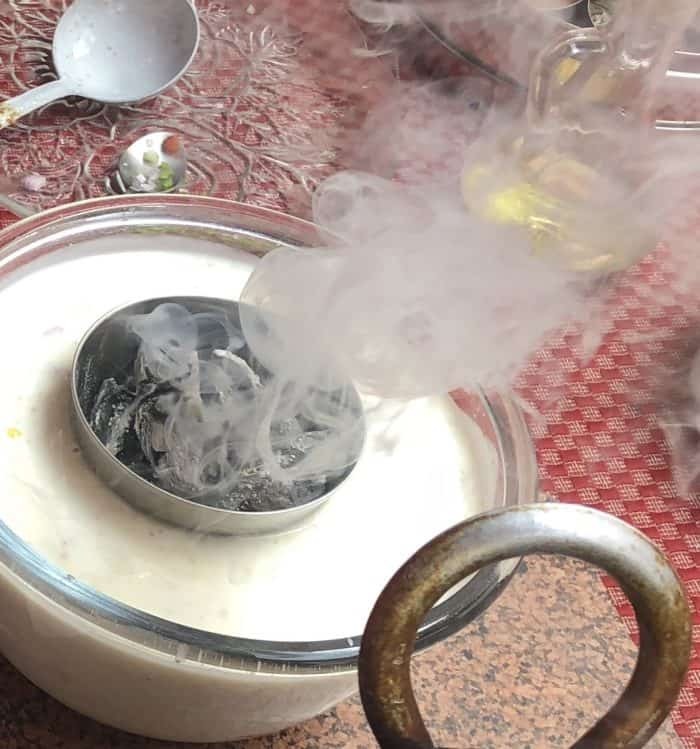 I loved their trick of adding a burning coal to a bowl of yogurt, then sprinkling it with hot ghee to produce an intensely smoked yogurt in just minutes. Sadly, they did not divulge the secret recipe for their special 38-ingredient Bedla sauce that requires eight months to make. At the complete opposite end of the culinary spectrum was a scrumptious lunch the next day in Ranakpur, at the food hall of one of the largest Jain temples in India. An architectural wonder the temple has 1444 pillars carved in exquisite detail with a no two are alike. 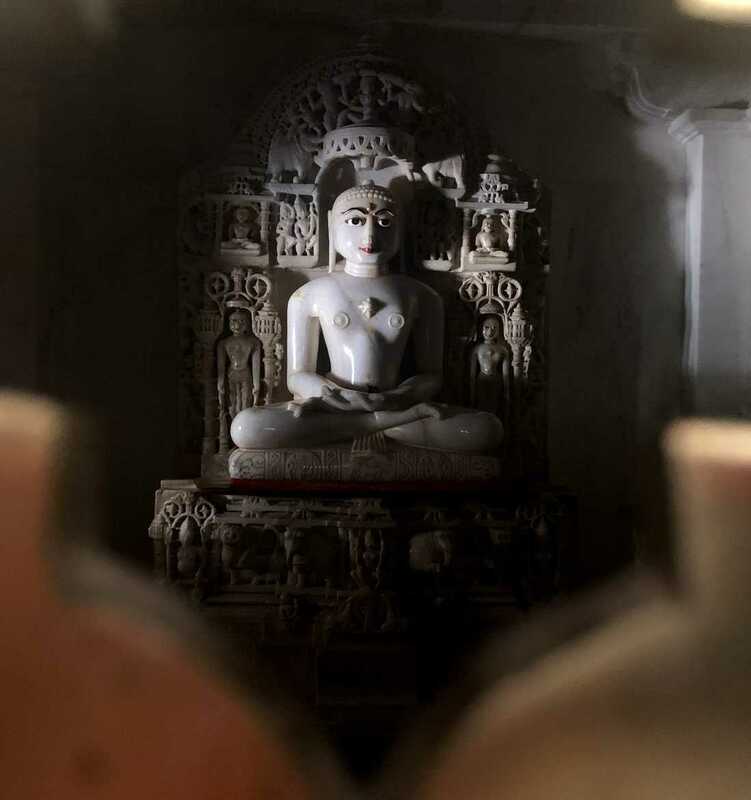 Stunning carvings throughout the Jain Temple. 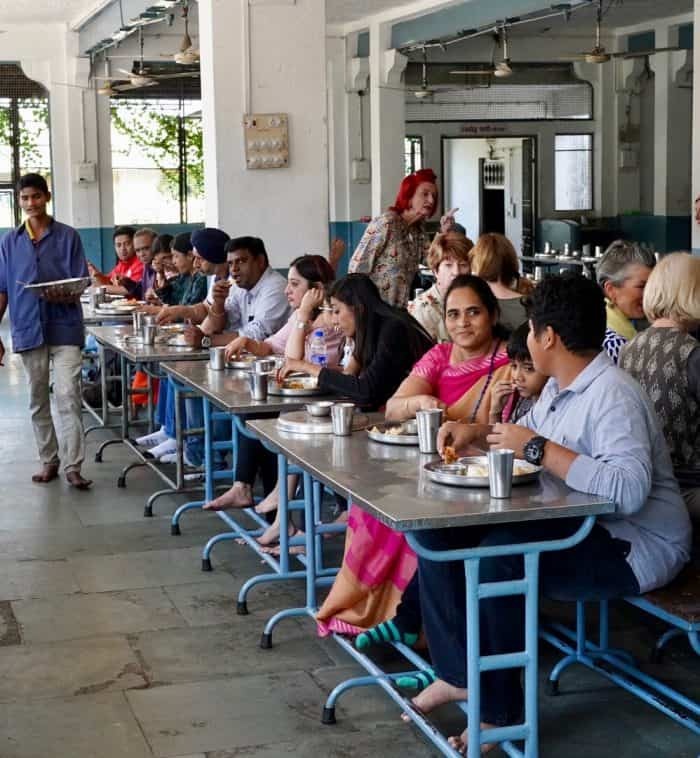 We joined the ranks of local pilgrims for a simple, yet delish, vegetarian thali lunch (costs under $1.00) served with great pride by devotees.